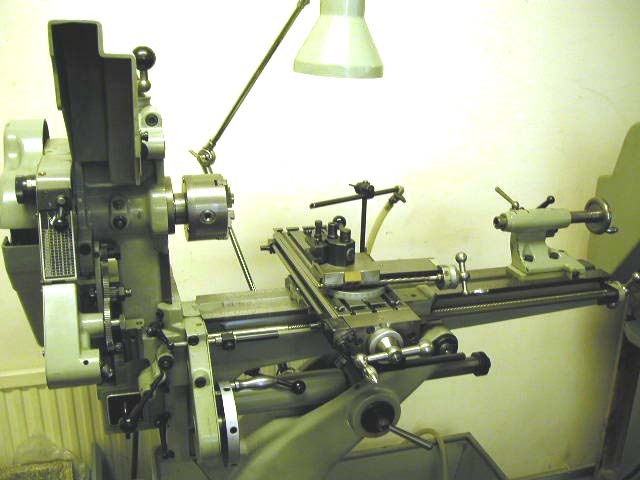 I first saw pictures of this machine when I was browsing Tony Griffith's Lathe site , and was immediately struck with the coolness of the thing - I didn't have a lathe at the time, had only seen one working once and was completely struck with metal fever. And of course, being me, I wasn't looking for a cheap working klunker to learn on, but started lusting after the ultimate machine, whatever that was.I thought about wanting a Schaublin, a Lorch LAS that sort of thing. Nothing too big, because I have an appartment on the 3rd floor with wooden floors and no elevator. If I had known about them at the time I probably also would have lusted after a Monarch EE, but a Unimat seemed nice, because it could do "anything". And then I saw those pictures of the M&B and thought "WoW! when I grow up I want me one of those (and I was 42 at the time:-)). 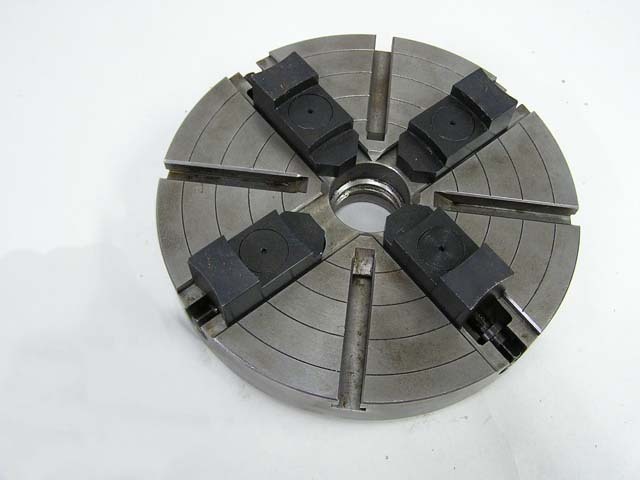 Some time later, having accumulated a couple of hundred pounds of unusable scrap iron (in the form of small "project" lathes with parts missing and no way to make or buy them), I stumbled across an internet ad for the Astoba and thought "Hey! that's a Meyer & Burger" I went and bought the thing on the spot, had it delivered to my storage and there the saga begins. Astoba stands for "A. Stoeckle, Bale" a machine tool trading firm that apparently still exists. They were, I believe, the original producers of the design which may have preceded world war 2, and whose swiveling bed may have been inspired by gun design, in which a spring acts to counterbalance the weight of the barrel. I quickly found out that Astoba don't have anything to do with the machine anymore, although I didn't get around to calling them. It seems Mrs. Meyer & Burger bought the design and started producing the machine somewhere in the fifties until the late seventies. They are now producing mostly very expensive and specialist sawing and slicing equipment for cutting ceramics, silicon wafers for producing computer chips and such. 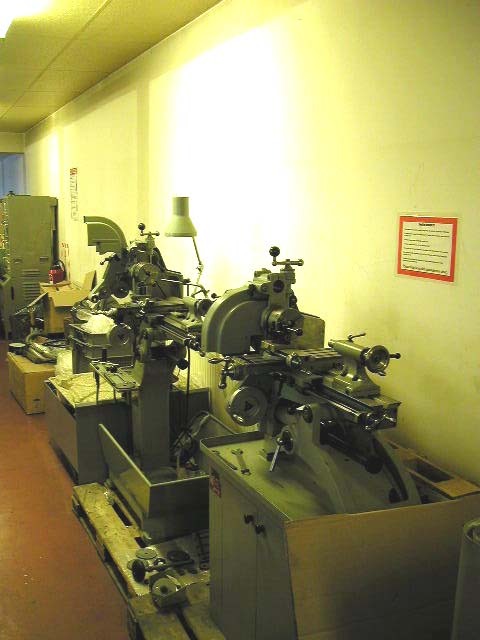 I did find some info on the net, and got to Edwin Brunner of Brunner Machine Tools in London, who is very nice and extremely helpful - he sent me a lot of documentation (the pictures on Tony Griffith's site come from the same leaflet that I got from Brunner). Apparently, when Meyer & Burger moved on to greener pastures, they sold the plans, designs, stocks, casting molds and patterns, the whole shabang for the UW 1, to a firm called Richard AG, in Murgenthal, Switzerland, who continued production until the mid 1990s. By that time, with production costs rising and demand falling it became uneconomical to continue production, even with cosmetic concessions such as simply painting the castings instead of filling them, and Mr Brunner, who had been the UK agent for Meyer & Burger and the UW 1 since the 60s aquired the complete inventory in partnership with Urben, a small family firm making precision grinding spindles in Inkwill, Switzerland. When I got the machine, the only thing that came with it was a cross slide, a chuck and a drawbar for collets. 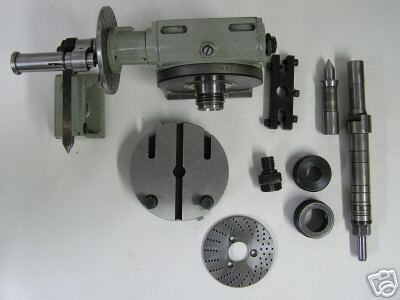 No tailstock, no overarm, no vertical table, no drilling spindle. Nothing. The machine used to belong to Shell, the oil company. Apparently the machine had been used to make gears for the counting mechanisms for the pumps in gasoline (that's petrol) stations. And when the machine was retired, all those beautiful accessories were put in a box which aparently went to the scrapheap. Aaargggh!. At the time, I thought I could easily find the missing bits, but was soon put in touch with reality. This is not a Myford, or South Bend, where you find hundreds parts on Ebay; this is a Swiss Precision Machine, and only about 3000 were ever made over a 50 year period. Sure, Brunner could supply all or most of the parts, but, with him being Swiss and the machine being Swiss, the prices were, well, Swiss. 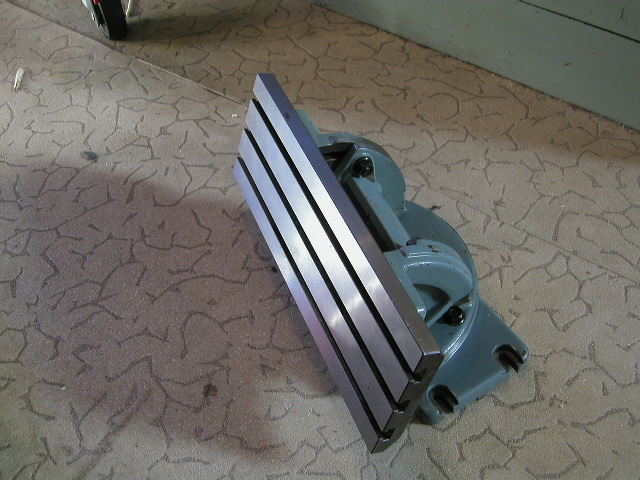 Think 3350 CHF (about 2100 Euros) for the tailstock. Hmm. I paid 450 Euros for the whole machine. This was a rude awakening, to find out what stuff actually COSTS when you're used to ebay prices for old iron. To be fair, think about how much work, and how much precision machinery it actually takes to make a tailstock from scratch: the casting, the machining, grinding the quill, grinding the base, making a nut, superfinishing the quil, all to very close tolerances and an absolutely superb finish. So off I was on the Information Superhighway: google for Meyer & Burger UW1 UW-1 lathe mill universal-werkzeugmaschine universal-machine-tool, you know the drill. Looking on eBay for a tailstock to adapt. Buy a crapped-out schaublin 90 for 150 Euros just for fun (I guess I'll make those parts for it later, when I've got a working machine and know how to use it). keep on packing that old iron. Breaking up with my girlfriend. Just keeping busy. 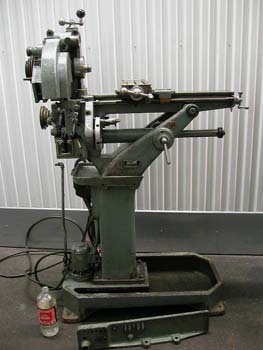 Until I found an english engineering company that had a "Meyer & Burger lathe and milling machine" in their capabilities list. I contacted them, and although they were extremely unresponsive, and wouldn't sell any of the accessories, although someone said "ah, that little machine, well, we don't use it anymore". 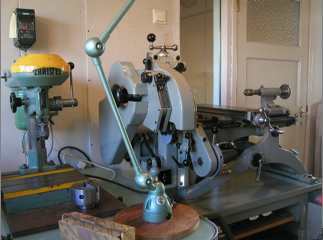 I kept on pestering them and finally, with the help of David Samways of Anglo-Swiss Tools, ended up buying the whole machine! this was a nice complete machine with most of the basic accessories (but no change gears, and no adaptor to use Morse 2 tooling in the spindle) but with a few nice extras: a vise , a faceplate , a couple of collets and a direct indexing head. The machine had been used for demonstration purposes only. This probably meant that it had been taken out once every few months, did a bit of machining, and put away. No cleaning, no lubrication. and it had been used with generous supplies of filthy coolant that had mixed with the oil and chips to produce a thick layer of crud on most parts of the machine. and because of lack of care and lubrication, it was actually quite worn for a machine that had been used for a couple of hundred hours, probably. I got it home, disassembled it and sent it oiff to have the slideways ground. 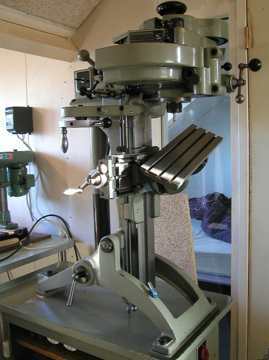 And on ebay germany I found a universal table for about 120 euros ( "universal table for milling machine deckel" it said. hehehe.) And on ebay I found an almost new full dividing head! 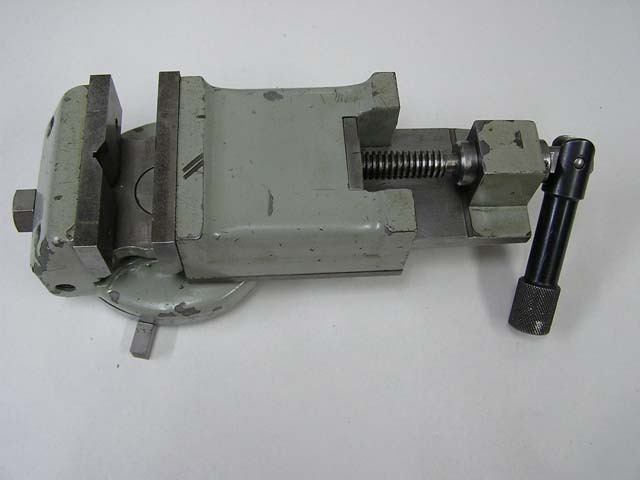 the seller didn't know what it was, and almost nobody else did, so I got it at a very good price, and got another vise, faceplate and overarm from him. The machine, meanwhile, was sent to the slideway grinders, Unislide in Nuneaton, England. 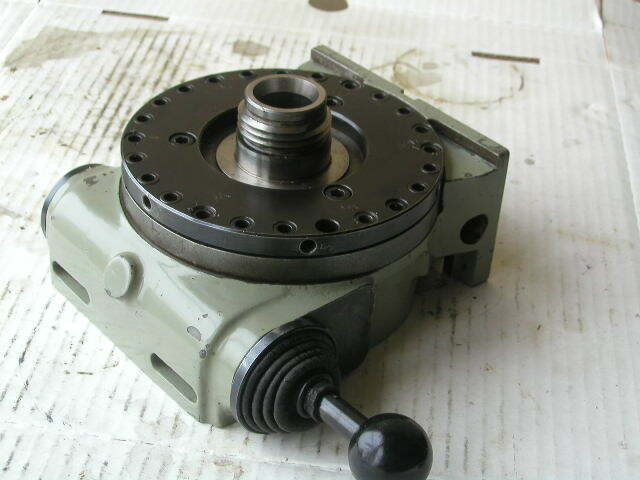 I ended up selling the extra faceplate and vice to Brunner, and swapping the Indexing Head for the slotting attachment. This is awesome! it's not very usefull, but it's so cool to see the whole machine going up and down! 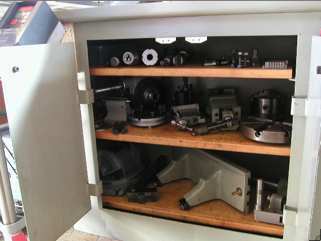 Then in late 2006, I got in touch with the owner of another ultra-complete Astoba: all the fittings and trimmings, a grinding attachment, automatic cross feed, collets, spindle extension, morse 1 and 2 adaptors, dividing head, vice, faceplate a boxfull of milling cutters. the machine was looking quite abused, but it was just a sloppy paintjob and dirt, it actually looks quite well for its age (more than 50 years). Although it has been lubricated with grease instead of oil and some small parts ar missing or have been been sloppily repaired, it shows signs of refurbishment: there are scraping marks that can't be original, the ways feel quite tight (and that's not only adjustment). 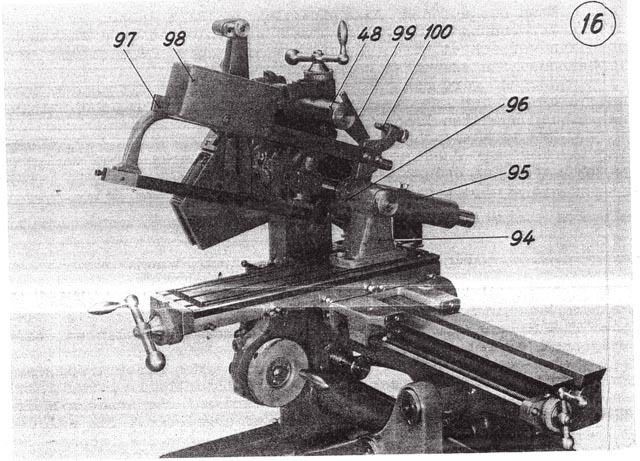 One thing that wasn't in very good condition was the pillow-block for the cross-feed; apparently, the machine had crashed at some point, and the feedscrew was probably broken, because it was welded together at precisely the point where it bears in the pillow block; thus wearing the block out. Having this machine was actually quite inspiring; it prompted me to jump the last hurdles that prevented me from using my own Meyer & burger: with that adapter I could finally mill the 0.23 mm off the lead screw nut (the bed and carriage grinding had lowered the carriage by that amount), and I had to make a part for the overarm of the astoba. So, now I am finally making chips! 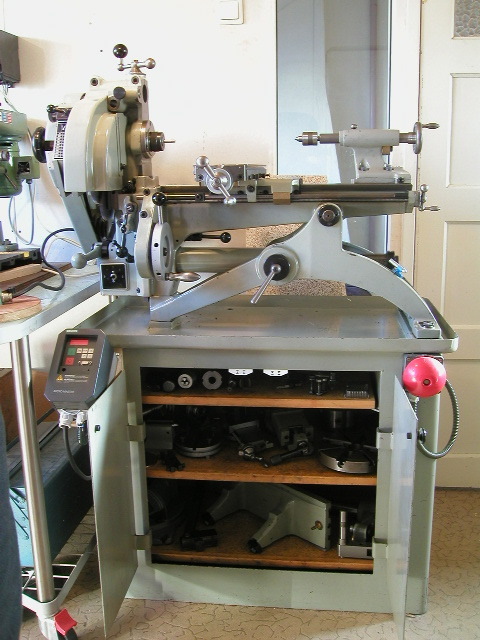 the Meyer & burger is now almost complete - to use it fully I still have to buy the Morse 2 adaptor sleeve, and get some Komet FG-I blades for the wonderful Tripan screwcutting toolholder, and, of course, bore and slot the gears. The green Astoba, with all its accessories, has now been sold.